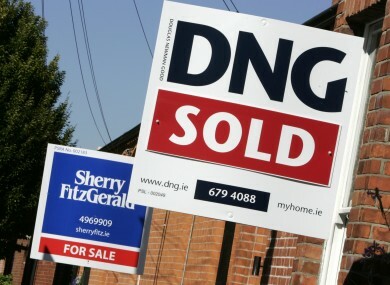 THE EUROPEAN COMMISSION and the European Central Bank have said that developments in the Irish real estate market “need to be closely monitored”. The organisations made the comments in their latest post-bailout programme surveillance report. The statement noted: “While there is little evidence of house price overvaluation so far, recent price and rent increases have drawn attention to persistent housing supply bottlenecks. “The government has repeatedly intervened in the housing market to support the recovery in the residential construction industry, but it will take time to restore an adequate supply of new homes. Although commercial property purchases are largely funded by foreign equity, close supervision of commercial real estate financing should be maintained. Since the Central Bank of Ireland macro-prudential measures were announced in late 2014, house price expectations have moderated. TheJournal.ie has contacted the Department of Housing about the statement. The government’s Rebuilding Ireland plan aims to build 47,000 social housing units by 2021 and double the annual level of residential construction to 25,000 houses. Email “Europe raises concerns about lack of housing in Ireland ”. Feedback on “Europe raises concerns about lack of housing in Ireland ”.